← Going deep inside the underbelly of Sicario. This article can be found in its entirety HERE. 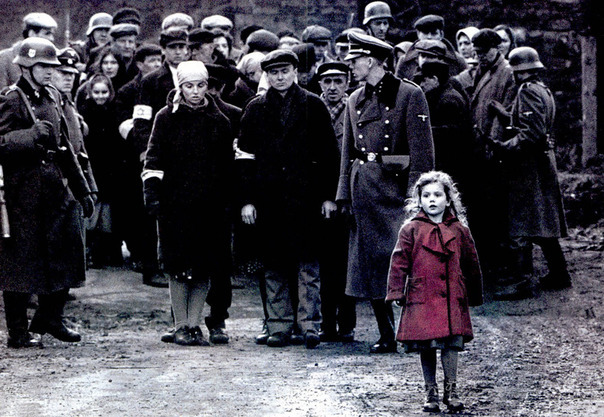 Sitting horseback atop a hill overlooking the Cracow ghetto, Oscar Schindler watches the Nazis mass-murder Jews when, amongst the massive atrocities, a little girl wearing a red coat catches his attention. He watches as the little girl first follows other Jews in line, then seemingly walks aimlessly about, passing no less than seven pointblank shootings without so much as a flinch before slipping unnoticed into a building while gunfire continues to echo throughout. She is but one amongst hundreds in the scene, yet her individuality, her specificity, humanizes the otherwise countless atrocities Schindler witnesses and she ultimately becomes the impetus for his change from German industrial businessman to sympathizer who spent his fortune to save over 1,000 Jews. Image | This entry was posted in Empathy, Perspective, Theme, Uncategorized and tagged Schindler's List. Bookmark the permalink.